The village around this beach looks like it hasn't changed in hundreds of years. It has a small population of only about 200. It looks and feels secluded from the rest of the island and the world. And yet there is a reason for tourist interest. For one thing, the black sand beach has lovely sunrises. The surf washes up a kaleidoscope of colorful stones and seashells onto the beach. It also has decent waves, and most of those who come here are looking for a good time surfing, from beginners to advanced surfers. The bottom of the sea here is reefy so you may want to wear protection for your feet. How popular is Cucukan Beach? 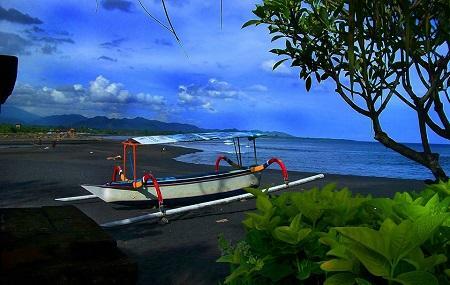 People normally also visit Keramas Beach while planning their trip to Cucukan Beach. Every beach is beautiful if you keep it clean, especially from plastic trash. This beach is good for relaxing or take a walk, since it's a quiet place. Not good to watch sunset but if you like a quiet beach then this is not a bad choice. I come here with my wife and son only to watch the waves after a busy day. At least, this beach is not as crowded as Lebih, Sanur, or Seminyak.